Resistance against exploitation is nothing new. History is full of examples of people—perfectly ordinary people—fighting back against injustice, exploitation, and the destruction of their lands and communities. They move through whatever channels for action are open to them, but often, left with no legal or political power, they turn to militant means to defend themselves. It is hardly a simple decision, and rarely the first or preferred option, but when all other paths have been explored and found to lead nowhere, militant action becomes the only realistic route left. Movements and communities come to that truth in many different ways, but almost without fail, they come to it borne by a collective culture of resistance. One inspiring example is the Bolt Weevils. The Bolt Weevils were a group of farmers in Minnesota who spent several years in the late 1970s perfecting the fine art of sabotaging interstate electrical transmission lines. Their efforts have been memorialized in numerous books and songs, and their story is a hopeful one we would do well to remember and re-tell. The story of the Bolt Weevils begins in the mid-1970s, when the Cooperative Power Association (CPA) and United Power Association (UPA) proposed construction of a new interstate high-voltage transmission line. Taking its name from the two cooperatives, the CU Powerline would carry current from a generating station in North Dakota across west-central Minnesota to feed the urban centers of the Twin Cities. In determining a route for the powerline, small farmers land was rated less important than large industrial farms, and as a result, the proposed route crossed the property of nearly 500 landowners. Outraged at being trodden over to for the benefit of industry and urbanism, resistance against the project began immediately in earnest. Once residents found out about the project, they refused to sign land easements. Local towns passed resolutions opposing the project and reject construction permits. The powerline went to review before the State’s Environmental Quality Council, which went ahead and granted the necessary permits in the face of overwhelming public opposition. When surveyors showed up out of the blue in one farmer’s fields, he smashed their equipment with his tractor and rammed their vehicle. The action of that one farmer helped catalyze popular sentiments into action. Farmers began using CB radios to notify one another about surveying activities, and would turn out in groups to stop the work. As resistance began to build, local radio stations would broadcast times and locations of protestor gatherings. Farmers and others who opposed the project began meeting every morning in the Lowry town hall, hosting others who’d come from neighboring counties, to make plans for each day. As surveying and construction continued, the locals escalated their efforts. They would erect signs in their fields to block the sightlines of the surveyors, and stand next to survey crews running their chainsaws to disrupt their work. Survey stakes disappeared overnight. Farmers used their trucks to make roadblocks and their tractors to pile boulders in the construction sites. One group even gained permission from the county to improve a rural road—they dug a ditch across it to stop all traffic. They filed more lawsuits, and the issue was eventually taken up by the Minnesota Supreme Court, which in the spirit of everything it represents, decided against the farmers and in favor of the powerline. Many of the citizens opposing the pipeline had earnestly believed in institutions like the Supreme Court and the structures of power. After their battles through the courts, many of them were disillusioned and had been radicalized. Law enforcement began escorting construction and survey workers, and the situation came to a head on January 4th 1978, when 100 farmers chased powerline crews from three different sites, fought with police, and even tore down part of a tower. The next week, the Minnesota Governor ordered the largest mobilization of the State Troopers in Minnesota’s history, with 200 Troopers—fully half of the force—descended on the rural area to ensure construction continued. Protests continued and grew, as the issue began to draw national and international media attention; hundreds turned out for rallies at survey sites, and some schools even let out so students and teachers could attend. In St. Paul, thousands of farmers rallied and demonstrated, and in March of 1978 more than 8,000 people marched almost ten miles through freezing temperatures from Lowry to Glenwood to protest the CU powerline. It was in the heat of August that the kettle boiled over. Bolts on one of the transmission towers were loosened, and soon afterwards, it fell over, as the Bolt Weevils entered the scene. Then three more fell over. Guard poles and bolts were cut and loosened, insulators were shot out. 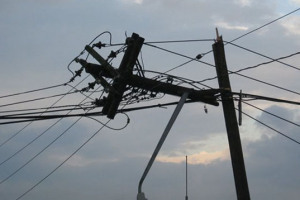 Over the next few years, 14 towers were felled and nearly 10,000 insulators were shot out. Soon, helicopters patrolled the powerline, and it was made a federal offense to take down interstate transmission lines. There were numerous arrests, some 120 in all, but only two individuals were ever convicted on felony charges, and even then they were only sentenced to community service. Opposition to the powerline was so common that in some instances, witnesses refused to testify against farmers. In the End, unfortunately, the powerline was built and went into operation, despite the protests and the disruptions by the Bolt Weevils. While they were unsuccessful in ultimately stopping the project, there’s much from their efforts that we can learn and apply to our work today against exploitation and civilization. As in most social struggles that turn to property destruction and militancy, that wasn’t the first choice of tactics for those on the ground. They fought for years through accepted legal and political avenues, turning to material attacks after all other courses of action had proven ineffective. But more than that, the popular agitation and organizing in the years leading up to the emergence of the Bolt Weevils didn’t merely precede militant direct action: it laid the groundwork for it. The work of the local farmers—their protests, demonstrations, civil disobedience, and community organizing—paved the way (forgive the phrase) and set the conditions for the sabotage that would later occur. By mobilizing residents and community members against the project, building social networks, and agitating and raising opposition against CU powerline, a collective culture of resistance was created, planting and watering the seeds from which the Bolt Weevils were born. With civilization churning onwards towards biotic collapse and underground resistance the only real hope left, caring for those seeds is our primary duty today. The story of the Bolt Weevils—like countless other stories of resistance—shows that militant resistance emerges from strong and supportive cultures of resistance. The time to start building such a culture was yesterday. For those of us who choose to organize and work in an aboveground and legal way, building such a culture that embraces and celebrates sabotage and the use of any means necessary to stop the omnicide of industrialism is our foremost task. The story of the Bolt Weevils isn’t empowering and inspiring because they “fought off the bad guys and won.” They didn’t win. The power lines were built, forced down their throats in the face of their resistance. No, their story is inspiring because it so clearly and undeniably demonstrates how simply feasible sabotage and material attacks truly are. Often, we talk about militant resistance and direct action as mysterious and abstract things, things that wouldn’t ever happen in our lives or communities, things that no one as ordinary as any of us would ever do. Whether we romanticize underground action or are intimidated by it, we generally talk about it as though it is something out of a movie or a novel. The truth is that such actions are simply tactics—just like petition-drives or street marches—that can be used to dismantle systems of power. The Bolt Weevils—a group of farmers with hunting rifles and hacksaws*—serve as a stark reminder that one doesn’t require military training and high-tech gadgets to act in direct and material ways against the infrastructure of destruction. We’re all capable of fighting back, and while sabotage against industrial infrastructure can be daunting for many valid reasons, technicality isn’t one of them. We may have to fail working through other channels (as if we haven’t already) before collectively turning to sabotage and attacks on industrial infrastructure as a strategy, and we will certainly need to build a supportive and strong culture of resistance. But if we’re serious about stopping the destruction and exploitation of civilization, we will be left with no other choice. *This is speculative. I don’t actually know how they shot out insulators or cut through guard poles, although there are plenty of accounts of hunting rifles and hacksaws being used in this fashion, and it’s from those stories that I hazard this guess. Time is Short: Reports, Reflections & Analysis on Underground Resistance is a biweekly bulletin dedicated to promoting and normalizing underground resistance, as well as dissecting and studying its forms and implementation, including essays and articles about underground resistance, surveys of current and historical resistance movements, militant theory and praxis, strategic analysis, and more. We welcome you to contact us with comments, questions, or other ideas at timeisshort@riseup.net.